Due to the particular location of the hotel (on a cliff), it does not accept children under 13 for security reasons. 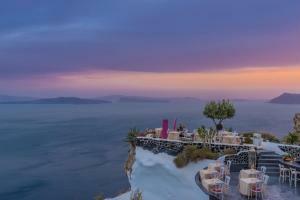 Premier Suite of 32 m² with private balcony overlooking the Aegean Sea, private hot tub and bathroom with shower. The Grand Suite, of 45 m², has an open plan design. It has an extra-large 1 bed, an elegant living room with a spa bath, a large bathroom with shower and a large private porch with incredible views of the Caldera. This suite features an indoor hot tub, panoramic sea views, a spacious 1 bedroom, a living room and a bathroom with a shower. An 3er guest can be accommodated at an additional cost. This 75 m² suite with 1 spacious bedroom includes a large living area, a dressing room and a spacious bathroom with a cave-style hot tub. It is on the upper floors and offers views of the caldera. Elegant suite of 80 m² with spacious porch with outdoor infinity pool of 40 m², spa bath, sun loungers, dressing room and hydromassage shower. Views of the volcano and the Aegean Sea from the porch are offered. This suite features a spa bath, a spacious 1 bedroom, a living room and a bathroom with a shower. Large villa with panoramic views of the Caldera, outdoor hot tub, 2 bedrooms with 1 large double bed, 2 bathrooms and dressing room. It is located on the Milostufili hill and offers access to the Andronis Exclusive Hotels facilities. It has butler service and shuttle service to and from the hotel. 1 guest can be added at an additional cost. The White House features a private infinity pool with caldera views, an outdoor hot tub and waterfall. In addition, there is 1 double bedroom, spacious living area with sea views and bathroom. The house is on a terrace of 200 m² where guests can hold a private dinner. This 1 bedroom suite offers direct views of the caldera, an outdoor hot tub, a spacious living area, a walk-in closet, and a spacious bathroom.